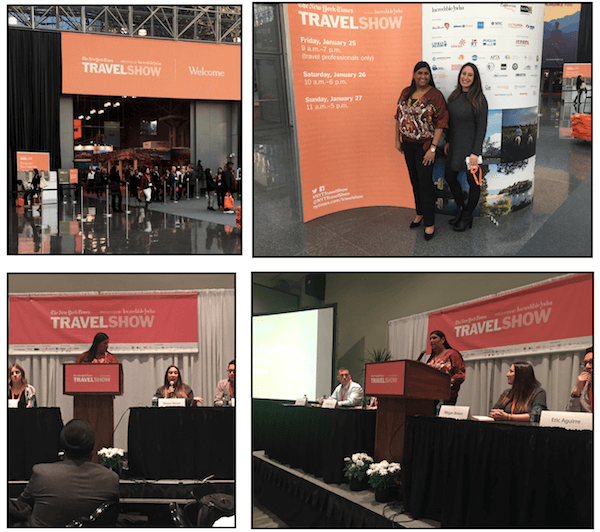 The 16th annual New York Times Travel Show took the Jacob K. Javits Center and NYC by storm this past weekend. With over 500 exhibitors from around the world, it’s an event that the TURNER team never misses. Thanks to diverse panel discussions and valuable international points of view, the show is a perfect opportunity for industry leaders to connect on the latest trends. This conversation also included Megan Brown, TURNER’s Senior Director of Social and Digital Communications. With the eclectic backgrounds of each panel member, the conversation ranged from travel booking behaviors to types of travel interests to digital influence and beyond. Studies show that 40 percent of respondents under 33 years old consider Instagram a powerful factor in deciding where to travel. Additionally, about 97 percent of millennials travelers will post pictures of their experience on the platform. The panel also discussed the importance of Instagram influencers in the travel sphere as well. This type of marketing serves as digital word-of-mouth. Users are more likely to visit a destination in order to recreate a memorable moment they saw a trusted influencer experience. Millennials want their travel experiences to be unique and exclusive. Ultimately, they want to be the first one in their crowd to do something. They also look for more authentic experiences than the typical “tourist” experience. A recent study found that 90 percent of this audience says that local food is more important than museums, beaches, monuments and so on. The takeaway here is that it is vital for hotels and destinations to keep in mind that millennials will pay more for an exclusive adventure than luxury accommodations.